alaTest has collected and analyzed 1326 reviews of Apple iPad 1 (1st gen 2010). The average rating for this product is 4.0/5, compared to an average rating of 4.3/5 for other products in the same category for all reviews. Reviewers are impressed by the size and design. The portability and performance are also mentioned favorably. Many are less positive about the GPS navigation and connectivity. We analyzed user and expert ratings, product age and more factors. Compared to other products in the same category the Apple iPad 1 (1st gen 2010) is awarded an overall alaScore™ of 90/100 = Excellent quality. alaTest has collected and analyzed 76 user reviews of Apple iPad 1 (1st gen 2010) from Amazon.co.uk. The average user rating for this product is 3.9/5, compared to an average user rating of 4.3/5 for other products in the same category on Amazon.co.uk. Reviewers really like the usability. The performance also gets good feedback. 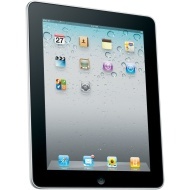 alaTest has collected and analyzed 429 user reviews of Apple iPad 1 (1st gen 2010) from Amazon.com. The average user rating for this product is 3.6/5, compared to an average user rating of 4.1/5 for other products in the same category on Amazon.com. People are impressed by the durability and size. The performance and usability also get good feedback, but opinions are divided on the reliability. There are some critical comments about the camera. The Apple iPad 3G brings universal, always-on connectivity with AT&T, but for many potential iPad users, the added utility won't justify the premium price. Sleek design. Gorgeous, sharp, accurate touch screen. Improved iPod, Safari browser, photo, and e-mail apps. A plethora of downloadable apps. Flexible and affordable 3G service plans. The addition of 3G to the iPad may be a mini-revolution for mobile computing — provided you can actually pick up a signal. A difficult-to-pinpoint target customer and a few pesky omissions are overshadowed by the excellent overall experience you get with Apple's iPad. And it sets the bar high for competing products in this nascent Internet tablet category. Apple looks set to shake up casual computing with tablet that offers clever design and ease of use. But that streamlined approach may also be the iPad's weakness. At the moment, there aren't any serious ones, soonest the iPhone4, upcoming: Samsung Galaxy Pad and MSI tablets.